In 1900, the Western League was renamed the American League, and the next year it declared itself major. Thus, on April 25, 1901 the Tigers played their first major league baseball game at home, defeating the Milwaukee Brewers in a remarkable ninth-inning comeback. They debuted in front of more than 10,000 fans, all cheering Detroit’s first American League team. The Tigers have utilized the same nickname in the same city longer than any other American League team. Amazingly, they have displayed the word "Tigers" on the team's uniforms in only 154 of these 17,500+ games. In 1928 the club sported road uniforms featuring strangely downward-sloping black and orange "Tigers" letterforms. They abandoned these after one season. The 1960 club ditched their traditional Old English D home jerseys for new ones which displayed a script "Tigers" wordmark. The Detroit home jerseys were well established as iconic by 1960. The first use of the Old English D was on the club's 1904 road jerseys. The home uniforms have featured some version of the Old English D every season since 1905, with several exceptions—1916, 1918-20, 1927 (a fantastically complex tiger head was used this year,) 1930-33, and 1960. The 1960 home jerseys were changed at the behest of club president and longtime baseball executive William O. DeWitt. He showed great interest in the finer details of uniform design throughout his lengthy career, a tradition carried on by his grandson, current St. Louis Cardinals president William O. "Bill" DeWitt III. DeWitt left the Tigers in November 1960 to join the Cincinnati Reds' front office. The following spring the Tigers announced that they were restoring the Old English D to the home jerseys. 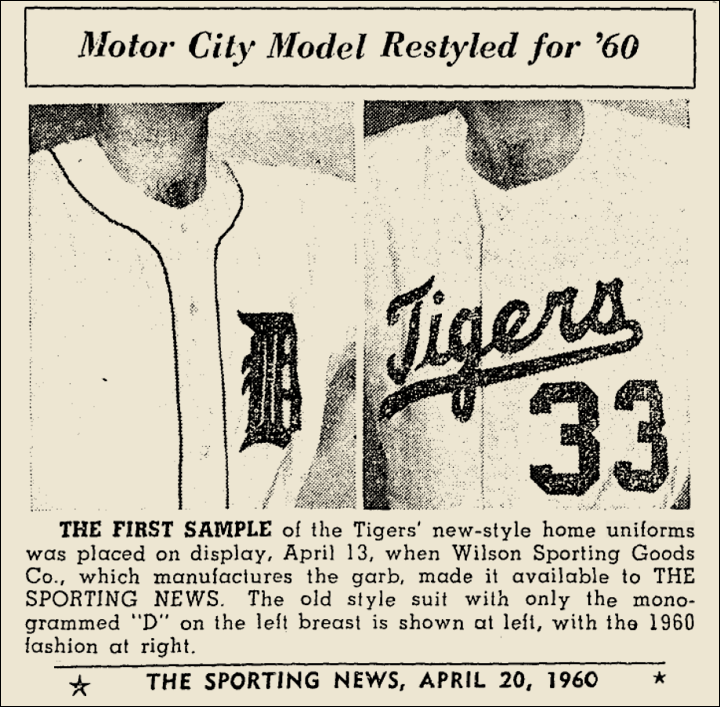 While the club has worn a number of one-off special event jerseys since then, the fact is that the Tigers have heralded themselves as "Tigers" in less than 1% of their games dating back to 1901. Mickey Cochrane—the Hall of Famer Who Reinstated the Tigers' Classic "D"